The Central Intelligence Agency needs to make sure its operatives are at the top of their game, so maybe it shouldn’t be a surprise games have become one of the agency’s most popular training tools? At this year’s SXSW, the CIA debuted a series of internal training board games, card games, and RPGs that are used to train officers in the art of intelligence gathering and problem-solving. These include Collection, a Pandemic-like board game where analysts collaborate to solve international crises, and Collection Deck, a card game where mazes and monsters are replaced by satellite photos and government red tape. There’s also one where you try to capture El Chapo, which teaches collaboration with other law enforcement agencies. According to CIA Senior Collection Analyst David Clopper, who first started developing the program in 2008, the board games are a creative way to quiz officers on their vast pool of knowledge and problem-solving skills. These games are basically one long Google interview quiz—they’re tough, detailed, and unforgiving. They also encourage players to work together toward a common goal, a necessary skill in intelligence gathering. Don’t expect these games in stores anytime soon. They’re solely designed for internal use, and were only dusted off so a lucky few could get a peek at them at this year’s SXSW. Ars Technica has a cool write-up about playing through some of the games, feel free to head on over and check it out. 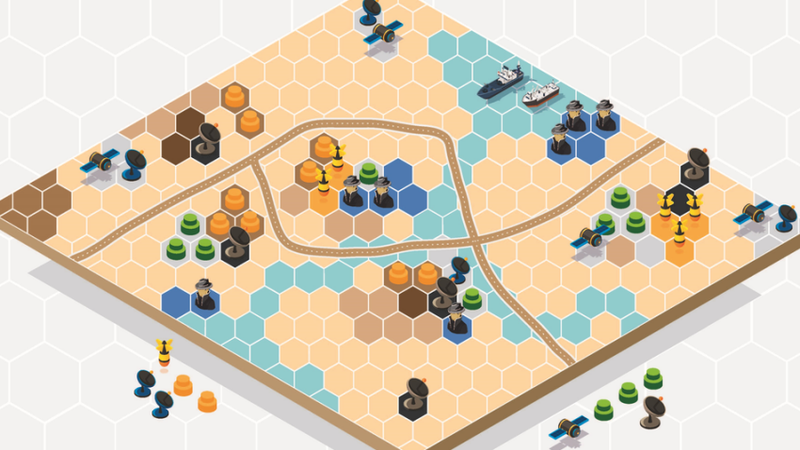 If you’re looking for games that simulate the information-gathering experience you could expect from the CIA’s gaming arsenal (albeit much easier), here are a few games you could definitely try out. Spyfall is a fun, quick-round party game where everyone (and no one) is a dangerous covert agent. During this game, every player is secretly given a location and suggested character role (i.e. “Hairstylist” at a Beauty Salon), except for the Spy, who isn’t told a thing. It’s the spy’s job to figure out where they are by sneakily asking questions of their fellow players, while everyone else is trying to determine who among them is the undercover agent. There’s a card version, but you can also play for free online using the internet browser on your phone. This collaborative card game pits teams of agents against one another in a word-based race to the finish. In Codenames, players give their teammates one-word clues so they can remove certain names and phrases from the game board. It’s a great experiment in secretive communication and collaboration. There’s also a naughty version, for those who want an extra chuckle after the kids go to bed. This more intricate RPG (from the designer behind Trail of Cthulhu) puts players in the roles of intelligence officials navigating a secretive government where nothing is as it seems. Because, spoilers, it’s full of vampires. The mix of gumshoe mystery and supernatural mythos make Night’s Black Agents a perfect role-playing game for those who want to build information-gathering skills while avoiding boring storylines like “South China Sea Conflict.” Because, let’s face it, demons are more fun. Note: Previous version of this article mentioned there were three games present, with a fourth in development. There are more games, so that total has been removed from the article.